Enter the improper fraction in the fields below to convert it to a mixed number. The calculator shows all the work so you can follow along and learn the steps. You might also like our calculator to convert a mixed number to an improper fraction. An improper fraction is a fraction that has no whole number and has a numerator that is larger than the denominator. These fractions can be simplified to mixed numbers in a few simple steps. The first step in the conversion is to use long division to find the quotient and the remainder. These will be used in the next step. When doing long division with a fraction, the numerator will be the dividend and the denominator will be the divisor. For example, let’s solve the quotient and remainder of 73. Thus, the quotient is 2 and the remainder is 1. 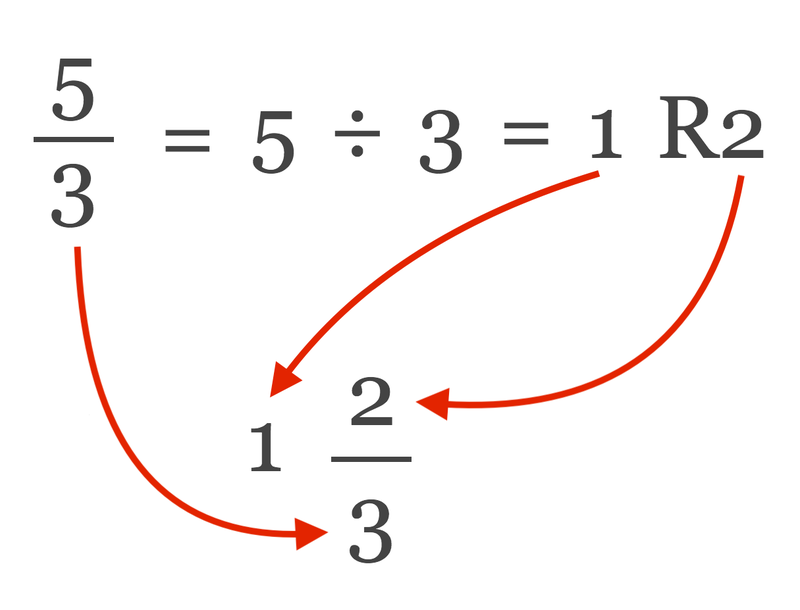 The second step is to rewrite the fraction as a mixed number using the quotient and remainder from the previous step, along with the original denominator. To convert, set the quotient as the whole number, the remainder as the numerator, and the original denominator as the denominator. For example, let’s use the quotient and remainder from the previous step to rewrite 73 as a mixed number. That’s it, you’ve rewritten an improper fraction as a mixed number in two simple steps!